What is Phosphorescent OLED (PHOLED)? With this rich set of features, PHOLED technology can enhance the performance of your displays and lighting products – providing real power savings advantages – for longer battery operation in portable electronics and less energy consumption in larger display and lighting products. We collaborate closely with each of our customers to custom design next-generation materials that meet their different specifications for color, efficiency and lifetime. 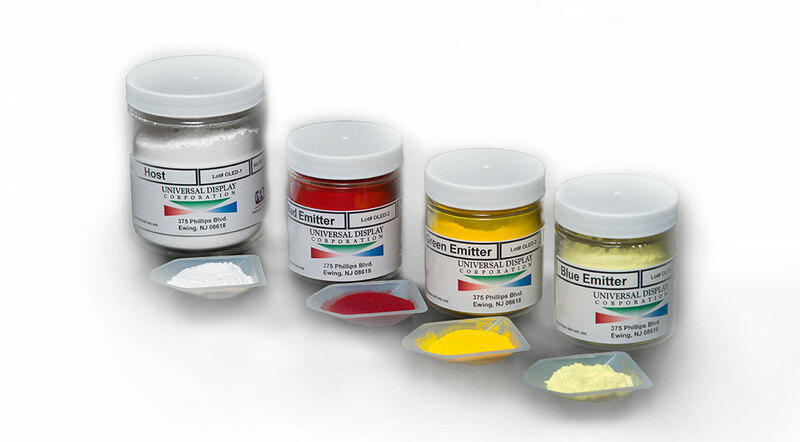 With different requirements that go across the color spectrum from deep colors to light colors for various applications, the ability to hit multiple product cycles is part of UDC’s core strength. What is a Phosphorescent OLED (PHOLED)? PHOLED (phosphorescent OLED) is an OLED that has up to four times higher efficiency than that of a conventional fluorescent OLED. OLEDs are monolithic, solid-state devices that typically consist of a series of organic thin films sandwiched between two thin-film conductive electrodes. When electricity is applied to an OLED, charge carriers (holes and electrons) are injected from the electrodes into the organic thin films. Then, under the influence of an electrical field, these carriers are transported through the device, until they recombine forming excitons. Once formed, these excitons, or excited states, relax to a lower energy level by giving off light and/or heat. Through the use of certain phosphorescent materials, our university partners at Princeton University and the University of Southern California discovered in the late 1990s, that up to 100% of the excitonic energy could be converted into light. This discovery was a major breakthrough. It meant that OLEDs could be up to four times more efficient than previously thought possible. 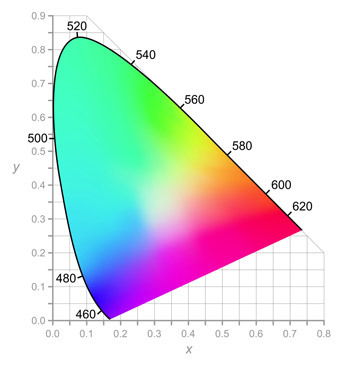 Phosphorescent technology enabled OLEDs to be more energy-efficient than LCDs (in many cases), as well as incandescent and fluorescent lighting. We are continuing to advance our research work in Blue for Displays & Lighting. With state-of-the-art chemistry and device laboratories at Universal Display, our multi-disciplinary team continues to invent and develop new high-performance PHOLED materials. Our commercial PHOLED materials are produced exclusively by PPG Industries and device-qualified at Universal Display – using proven manufacturing practices and established quality management systems. 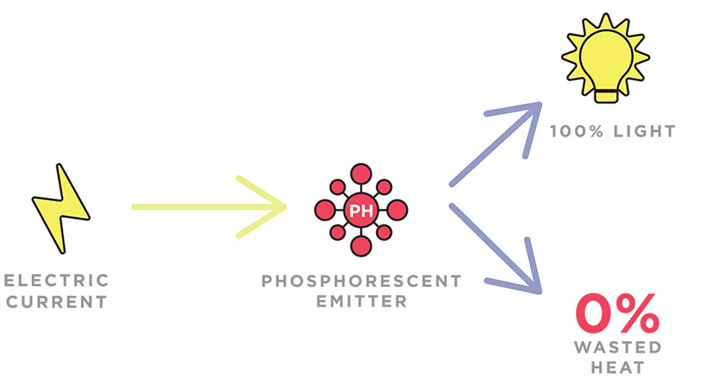 The standard approach for manufacturing a small molecule OLED, including a PHOLED, is based on a vacuum thermal evaporation, or VTE, process. With a VTE process, the thin layers of organic material in an OLED are deposited in a high-vacuum environment. An alternate approach for manufacturing a small molecule OLED involves solution processing of the various organic materials in an OLED using techniques such as spin coating or inkjet printing onto the substrate. Solution-processing methods have been in development for over 15 years. There are a number of challenges with this method, including the ability to meet the pixel performance required for commercial specification. For several years, we worked on P2OLEDs under joint development agreements with Dupont Displays and then Seiko Epson Corporation. If solution printing process does become commercially viable, our P2OLED phosphorescent materials are available for use.